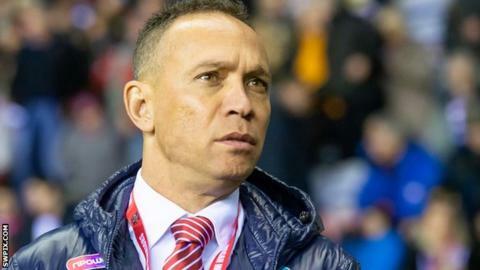 Shaun Edwards' decision not to take up the Wigan Warriors head coach role in 2020 has left existing boss Adrian Lam in a quandary, given his intention to return to Australia in October. Ex-Warriors half-back Lam, 48, was set to hand over the reins to the Wales defence coach at the end of the season. However, confirmation that Edwards will no longer be returning has seen Lam's odds shorten with bookmakers. "Events have happened this week that everybody knows about," he said. "Up until this point I've not really thought about it. It's not really the week to focus on it too much and it's something I'll consider in the next week." Wigan are at home to St Helens at the DW Stadium for the traditional Good Friday derby between the two fierce rivals, one of two games in four days for Super League clubs. Lam, whose son plays for his old club Sydney Roosters in Australia, left a role with the National Rugby League club's age-group set-up to come to England for the current season. "I was always going home in October - that was the plan from the start and still is at this point in time," Lam said. "It (staying for next season) wasn't in my thinking but things change. Like I said, I'll think about it next week. "We've got a massive weekend now with Friday and doubling up on Monday, and my priority now is making sure we get that right." Other than a spell as Papua New Guinea boss, Lam's coaching CV has chiefly been as an assistant in the NRL before taking up his Wigan post. Thus far it has been tough going, having succeeded former player and club legend Shaun Wane following last season's Grand Final triumph. Changes in personnel, plus injuries to players such as Sean O'Loughlin and Dom Manfredi, have not helped his cause. "I've really enjoyed it, it would be a bit better if we were further up the table," Lam told BBC Radio Manchester. "But as a coach I'm learning those different parts of a season and a squad where I'm managing injuries and making sure we bring the young ones through. "We've been competitive in every game and had a chance to win every game so that's positive - but there's no bigger weekend than this one."